People who wear a wristwatch know that wearing a watch can be painful in the summer. After the temperature goes up a little bit, leather strap is impermeable and easy to sweat, even the stainless steel bracelet with the cool and refreshing look appears to be burdensome. So, it is particularly important to select the watch strap materials for summer. NATO watch strap, is the focus of this article. NATO watch strap is very hot right now. It is made of nylon and has a solid polished stainless steel buckle. In the 1960s and 1970s, this nylon watch band was originally used in military wristwatch field. Talking about the origin of this watch strap, there are several interesting statements. It is said that during World War II, British military personnel first used this strap. Compare with the common nylon strap, NATO strap also has a very big distinction on appearance. Besides being attached to the watch’s lugs, the back of watch is added a band. More, the position of watch body is equipped with anti-slip buckle. At the same time, the size of the strap is also long enough to be folded at the end. If a soldier is injured and supplies are scarce, such a long strap can be used temporarily as a bandage. What’s more, many people see NATO and know that it was designed and produced by the British ministry of defence. Naturally, it will be associated with the North Atlantic Treaty Organization, just its abbreviation is NATO. In fact, this kind of strap has nothing to do with North Atlantic Treaty Organization. After the cold war, the NATO watch strap was sold in military stores, and its item number was similar to the article number of NATO munitions, so they were confused together. Moreover, it is worth mentioning that, while the reputation of NATO strap is loud, it is not the original name of the NATO watch band. If the official name of the strap is to be investigated, the G10 is the truly recognized title. 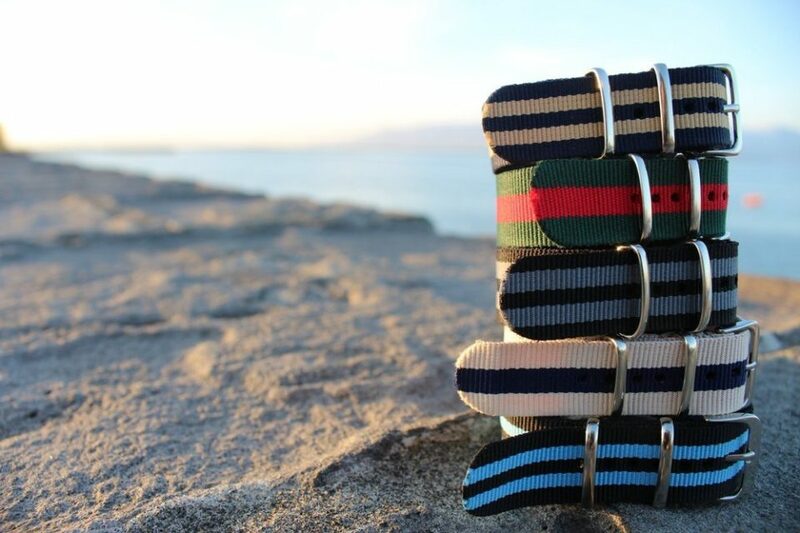 But it is important to say that the most popular watch bands today, the NATO watch strap that has been used since the 1960s and 1970s should not be ignored. At the beginning of the manufacturing process, the design concept of NATO watch strap did not contain the elegant and fashionable features. Its goal was just to make the strap simple, practical, and cheap. So, the standard NATO watch strap we can see now is still comfort because of its elongated feature. Compared with other materials straps which are suitable for summer use, this strap with tough and wear-resistant texture is more breathable than rubber strap, and the price is more populist than the ceramic band. More, profusion of colors also greatly enhance the fashion of this nylon strap. Whether it is the formal dress or casual wear, just choose the right nylon strap, your watch in the summer can easily access a variety of occasions. By the way, in 1964, the third film of the limelight 007 works – “Golden Finger”, The Rolex Submariner Big Crown watch, played by Sean Connery as James Bond, is paired with a nylon strap in black, chestnut and khaki. Due to this wristband is so eye-catching that many people today mistakenly regard it as a NATO watch strap. But apparently it appeared 10 years earlier than the production of the NATO watchband. However, this still can not prevent people from habitually calling the NATO strap with this stripe as the “Bond band.” And those who love the Rolex watches are also keen to add a “Bond band” to their watches. Also, in the 51st year after the film released, Bond really wearing “Bond band” appeared on the big screen. In the poster of the forthcoming the 24th 007 “Ghost Party”, the Omega Seamaster 300 Master Co-Axial worn by Daniel Craig, is equipped with Bond band. Today, the NATO watch has also produced many changes, such as American military single-band strap and NATO Zulu watch strap with the thick ring buckle. Obviously, the NATO watch strap, which was conceived by Britain’s defence ministry, has evolved beyond military apparel and has become a fashionable choice for the public to wear wristwatches. Moreover, many high-end watchmaking brands have turned to NATO watch strap fashion trend, for instance, Rolex, Tudor, TAG Heuer and Omega. In addition, the popularity of NATO’s watch band is not just due to the above reasons. It also has many advantages that other materials straps or bracelets can not be compared. The first advantage is that it has a lot of colors, and it’s very different from steel bracelet and leather straps. The wristwatch with this band is very conspicuous and can satisfy your desire to show off. The second is the low-key nature, but this is not inconsistent with the first point. For example, a full gold Rolex watch with a NATO watch band just looks like a stylish watch, and the impact of the shape implies the price of parity. Like the billionaire who has a strong relationship with the President in “House of Cards”, wore a watch with the green NATO strap. And the third point is the advantage of the band itself. The strap is long enough to allow you to put your wristwatch on your feet, such as preventing theft, etc. The next point is its good breathability. The material is very light, wear-resistant and durable. The fifth, it’s easy to remove with no tools, and this also means that this strap facilitates the replacement and cleaning. Of course, it’s easy to keep. As we all know, the straps can’t be rolled, steel bracelet is easy to scratch. And the watch band that can be tucked into the pocket of a pair of jeans can only be the NATO watch strap. Furthermore, the sixth is that some watch lovers are allergic to steel bracelet. If they don’t want to buy a gold watch, then the NATO watch strap can solve such problems. And last but not least, the price is quite customer-friendly. People can change the watch bands as they like. This is the latest popular NATO watch strap, and fashion of you should try it!